The Jaguar, low level, tactical strike aircraft, was built by the British Aircraft Corporation and Breguet of France. The Jaguar was originally designed as the Breguet 121 for the French Air Force. The UK wanted a higher performance aircraft and the French agreed to the joint requirement and development programme to the UK standard. Work was shared between the companies although the aircraft was primarily considered French. The engines were the Rolls Royce Adour with French participation. This engine is also used in the Hawk advanced jet trainer although the Jaguar version has reheat. SEPECAT (joint airframe company) set up 1966. Turbomeca (joint engine company) 1966. Exported to India, Oman and Ecuador. 400 built for RAF and FAF. 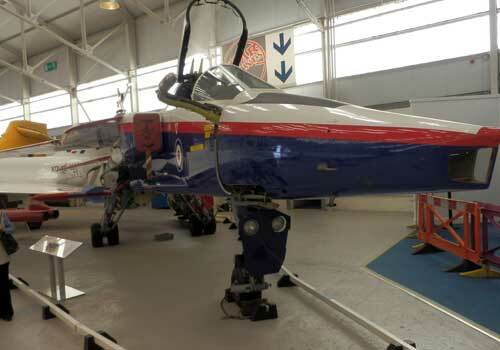 The Jaguar Fly By Wire programme based at Warton was to prove the system of using electronic controls and unstable flight, prior to the Experimental Aircraft Programme (EAP) and Typhoon. The aircraft is now at the RAF Museum Cosford. 25 May 2007 - the RAF held an event including fly-past at Coningsby to mark the disbandment of the last Jaguar squadron (no. 6) in service. The end of the Jaguar was brought forward to the end of April 2007 as no further deployments were anticipated and it would enable Typhoon ground attack to be given more focus. The aircraft was in service for 33yrs. Aircraft Illustrated, July 2007, has a full report with good photographs of the event and Jaguar in-service.